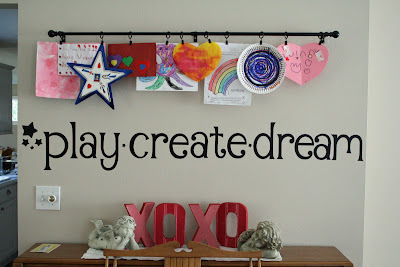 Wall Words ~ DIY Style! 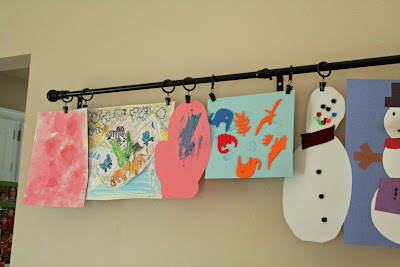 Last week I posted a picture showing how I display some of my children's artwork on a curtain rod above the piano in our playroom. The curtain rod works beautifully for us, however the height looks a bit high. Still, I like the rod placement because it means my little boy isn't tempted to pull at the artwork on display. 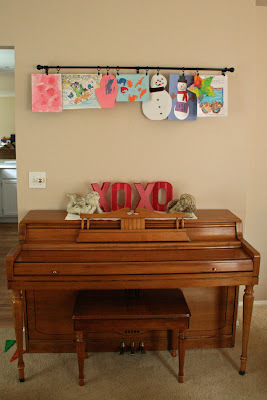 I've been considering a few options to make the wall space "disappear" between the artwork and the piano. Ultimately I decided on a vinyl wall quote. 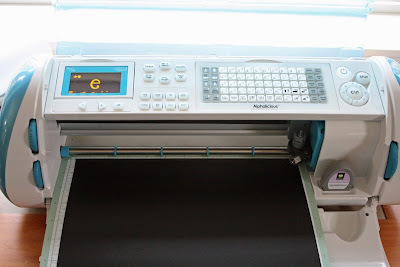 As I was Googling and browsing etsy, I realized that I could use my new Cricut Expression and cut my own vinyl. Keep in mind I haven't used my Cricut for ANY project yet. Still, I was looking at spending $15-40 on wall words...making it myself would cost a lot less. After a bit of research, I decided that I should go for it. Yes, I'm a researcher--I like knowing my options! I ordered my vinyl from Expressions Vinyl. They sell vinyl in strips and rolls--I opted for the strips because they ship faster than the rolls and once I decide on a project, I want it done immediately! Ultimately this project took 2.5 strips of black vinyl ($1.89 a strip x3 = $5.67) and two strips of transfer tape ($1.99 x2 = $3.98) The total cost of the supplies I used for this = $7.56 Not bad, especially since I ended up doing seven inch tall vinyl. It isn't perfect, but I'm really happy with it. 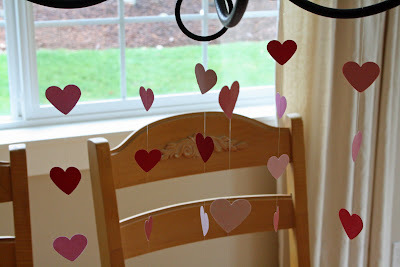 (And yes, I still have my Valentine decorations up!) I did it all myself and learned a lot about my Cricut in the process--including that I still have a lot to learn! And, it achieves my purpose in grounding the curtain rod and closing in the expanse of wall. 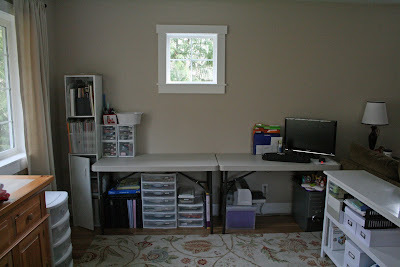 Post added to the Makeover Party at Sanctuary Arts at Home and to I Heart my Crafty Cutter at Serenity Now! My daughter is a bow girl and has been since she was about one year old. She's six now and still loves her bows. 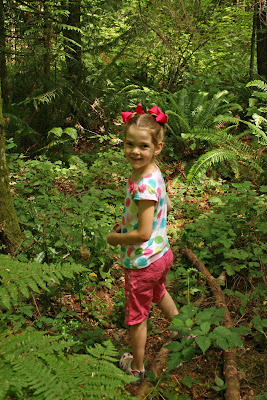 She wears them everywhere--with her school uniform, out to play, and even on walks in the woods. Bows aren't all that common where we live and the girls who do wear bows typically stop wearing them long before kindergarten. I'm happy my girl is a bow girl and I hope she stays one for quite awhile longer. 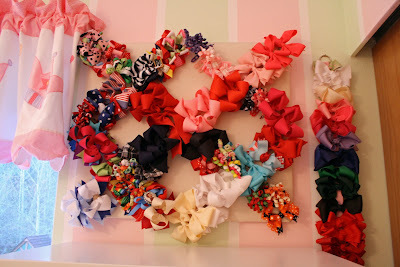 Of course this means we have a lot of bows. A lot. I don't even keep all her bows after she has outgrown the matching outfit--I've sold hundreds of bows at this point. When she moved into her big girl room (and out of the nursery) just before she turned two, I spent a lot of time making it girly and sweet. Pink, green, and white--I still love it! I also needed to come up with some bow storage because the collection was getting crazy! I pulled this French memo board out from under my bed (literally! 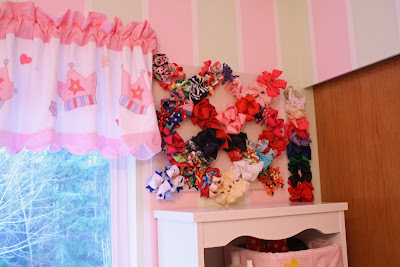 ), put it on the wall, and clipped her bows onto it. It works beautifully and we've used it for the past four years now. A couple of years ago I did add in the second bow holder you see to the right--that's just a metal ring with a long ribbon attached to it and the bows just clip on the long ribbon. The memo board holds an immense amount of bows. I have them packed on there! At any rate, this is a cheap, easy, and cute way to hold and display my daughter's bows. I'd rather spend the money on her bows instead of on an expensive bow holder. While shopping at Goodwill (the horribly over-priced closest Goodwill...they charge more for used stuff than Target charges for it new!) 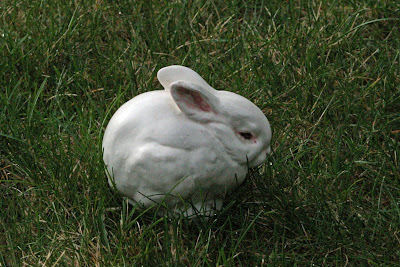 I spotted this little bunny. He was a little too realistic looking for me...but he was 50% off, so I had to buy him. 50% off means I paid $1 for him instead of $2--probably the price he cost at the dollar store I'm sure he came from originally. 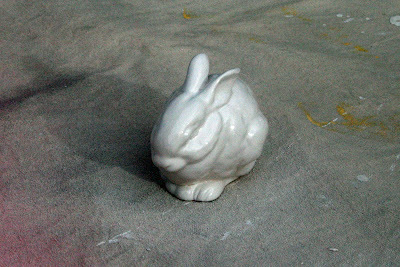 A quick blast of white spray paint and he's cleaned up and ready for my spring decorating! Some people might prefer the realistic original version, but I prefer this version. I suspect he'll end up with a little bow around his neck. He'll work well in my spring and Easter decorating...but first I need to get my Valentine decorations down! 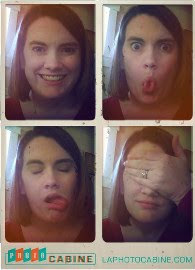 Ever wished you had your own photobooth? Or maybe I'm alone in that regard... Anyway, here is a site where you can turn your computer (with webcam) into your own photobooth! 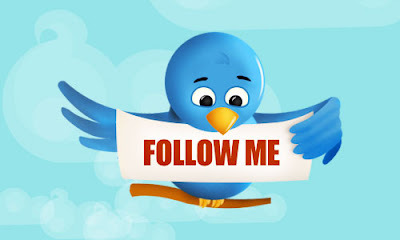 I had fun with this and am looking forward to sharing this site with my children. Yes, the site is in French (and I don't speak French!) but I just fumbled my way around until I made it work. It was fun! Our office area is a work in progress--but I've actually made progress on it, so that is an improvement! The picture above is from the very end of the construction phase of our house addition. We now have our family room furniture clustered around the rug in front of the fireplace--which left all that room behind the couch (around the other rug) for an office area. Up until now our office area has been (mostly) hidden inside an armoire in our formal living room. There also was a corner of our master bedroom that was overrun with scrapbooking items. However, I'm still not completely sold on the idea of having everything out in the open, so we didn't want to spend very much money on our office area...just in case I change my mind! 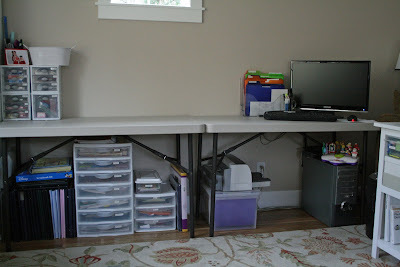 Instead of buying nice wood desks, we bought two folding tables at Costco for about $30 each. Functional, not too horrible looking...but they did nothing to hide all our stuff. I don't like seeing clutter and this is a lot of clutter! Well-organized...but still clutter! 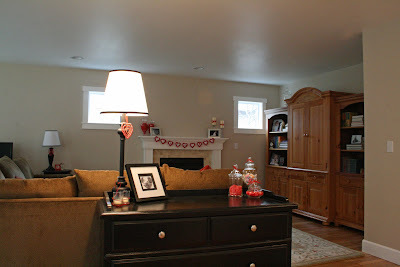 See those white bookshelves on the right--we built those using plans from Knock Off Wood. They're knock-offs of the Pottery Barn Cameron Two Shelf Bookcase. It worked beautifully! I sewed (just straight lines--nothing fancy!) 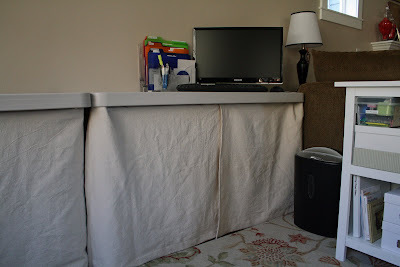 two panels for each table because my husband wanted a place where he could easily reach in to get things or put his legs when he's sitting at the computer. (I didn't really understand the need for a leg spot since he usually sits like a five year old with his legs curled up under him, but whatever, I humored him.) Then I hotglued the panels to the edge of the tables. I used a LOT of hot glue--so far it is holding on really well! The area definitely still is a work in progress and needs some wall decor and prettying up, but I'm thrilled to no longer be seeing all that clutter under our desks/folding tables/cheap solution! I know it is a bit beige right now, but I think wall decor will help break up the beige factor--plus my Pottery Barn area rug has lots of big flowers--you just can't see much of it in these pictures. More pictures to come after I make more progress! 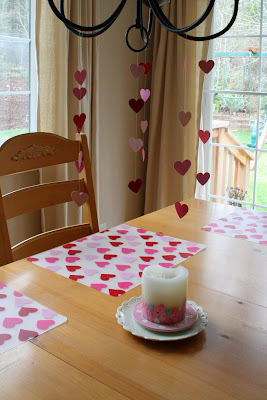 I'm linking this to Jen's Weekend Wrap-Up Party and Kimba's DIY Day. When we did our house addition (expanded family room and eating area) we turned our dining room into a playroom and have been very pleased with this decision. There wasn't a lot of available wallspace in the room as it is open to our "formal" living room but I did want to find a way to display some of my children's artwork. The only space available was a five foot wall above the piano. It was the perfect length for a small curtain rod. I purchased this rod and the ring clips from Target. 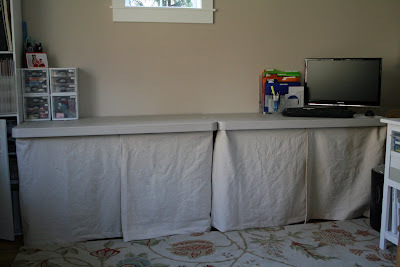 It is the same rod style that I used for my dropcloth drapes in another area of my house. My children are thrilled to have their artwork up and I love having it up. I know some people use art display systems from Ikea or Pottery Barn, but I don't live near those stores--plus this rod was very inexpensive and it matches (in color and general style) the curtain rods and chandelier that I already have in this space. Yes, the rod is centered on the wall--it is hard to tell, but the wall turns a corner just a few inches beyond the piano. If you look at the trim along the floor, you can see that it is farther back than the piano. I'm still deciding whether or not the rod is too high. I like that the artwork is high enough that the children can't tug on it, but I'm not a huge fan of the empty space below it. I'm still pondering this one. I linked this up to DIY Day at A Soft Place to Land. Connie at The Young and the Relentless swapped the colors around on the puffy heart felt garland--I love the way it picks up the red candlesticks she has. 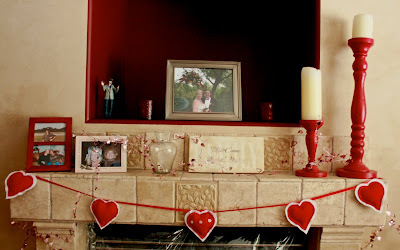 Karri at Living Out Loud made the puffy heart felt garland too and it looks so cute on her mantle! Anyone else? I'd love to link you up! 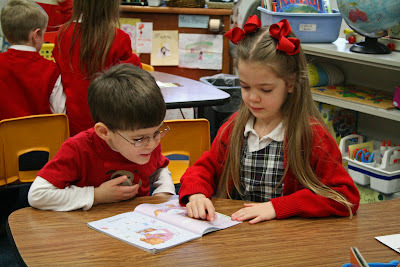 My little boy celebrated Valentine's Day at preschool on Wednesday. He was so excited to bring in valentines for his classmates and teachers. 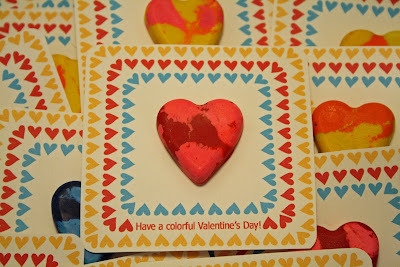 We opted to make crayon hearts--the same preschool valentine that Princess handed out a few years ago. 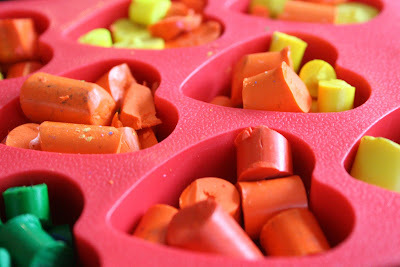 ...and put them into silicone ice cube trays. 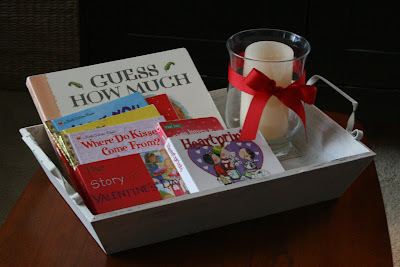 I bought these trays last year for $2.50 for a two pack at Target (in the dollar spot at the front of the store) but you can also make them using the Reynolds foil hearts that are available at Dollar Tree. 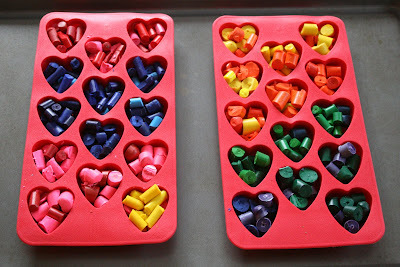 That's what I used the last time I made crayon hearts. 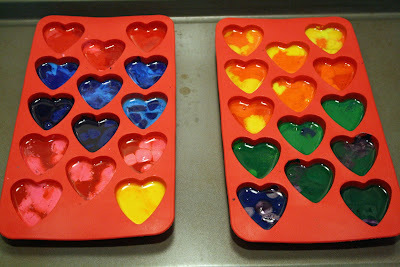 Group similar colors together to get extra pretty hearts...and skip the grays and browns. I put my silicone trays on a cookie sheet to give them stability. 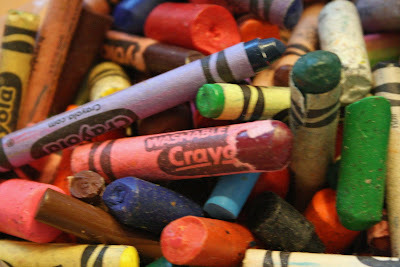 The last thing I want is crayon wax spilled anywhere! I baked them at 275 degrees for about ten minutes--basically until everything looked melted. 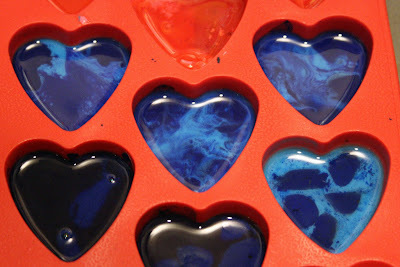 The blue ones were gorgeous when they were liquidy--they were so vibrant and pretty! Leave them in the trays until they're solid, then just pop them out. 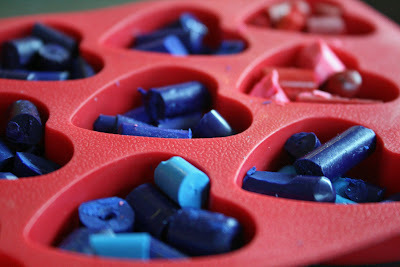 I ended up with a small amount of blah white wax that rose to the tops of some of the crayons, so I shaved that off with a knife after I popped the crayons out of the mold. Then I used foam tape (from the scrapbook section at Michael's) to attach the crayons to these cute cards--my little boy wrote his name on the backs of all the cards all by himself. Proud mama moment! I can't take credit for the cards--I found a PDF over at The Long Thread where Ellen did all the work! All I did was print the pictures onto cardstock, cut them out, and use my corner rounder punch on them. 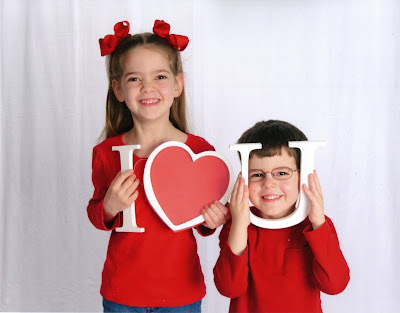 These valentines turned out super cute and, had I not needed a $56 new ink cartridge for my printer (ouch!!) would have been free to make using supplies we already had at home. As an aside, as the mama of a nut allergic child, I like trying to lead by example and show other parents that holiday treats don't always need to be candy. I'm biting my tongue and trying to lead by example rather than by lecture. 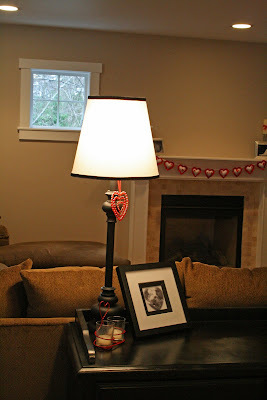 My house is all decorated for Valentine's Day and looks so cute with all the pops of red. I don't go all out for this holiday, but I've been adding a few more items each year. This year I mostly added homemade items. The picture above is my "formal" living room. On the black armoire (which used to hold our computer and now mostly is empty) is the red love sign I made last year. This tray (from Target!) is on the living room coffee table. In it I put a candle and a few children's books about love from around the house. And, of course, I brought back out the wedding pictures that had been tucked away during Christmas. We celebrate our ninth wedding anniversary this summer! 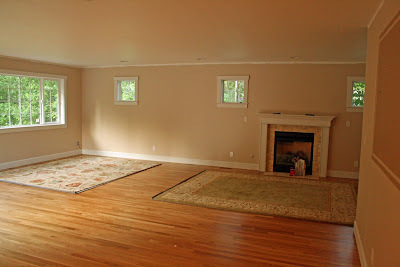 Our playroom is directly behind the living room sofa in what used to be the dining room. I have our piano in there and am a nervous wreck about it! The piano is a relatively new addition to our home and is the piano my mom and aunts used when they were little. It isn't anything fancy, but it is in pristine condition and has a lot of sentimental value. I think I'm going to have to get foam to wrap around the legs--it will be unattractive, but at least the piano will be a bit safer! 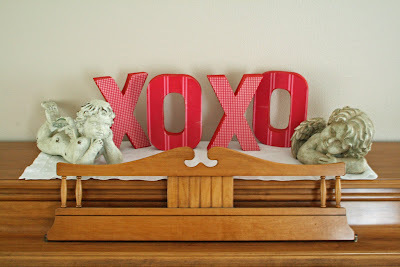 At any rate, these garden cherubs and Mod Podge cardboard letters are on top of the piano. I painted the back and sides of the cardboard letters (from Michaels) with red paint and then Mod Podged scrapbook paper on the front. 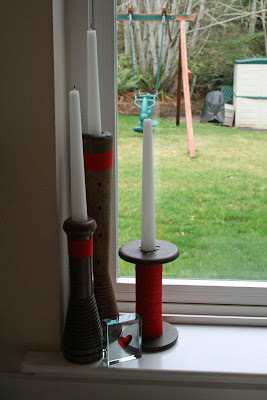 My antique wooden spools are in the kitchen window. The red ribbon wrapped around them is leftover from Christmas--I thought it still applied, even in February! 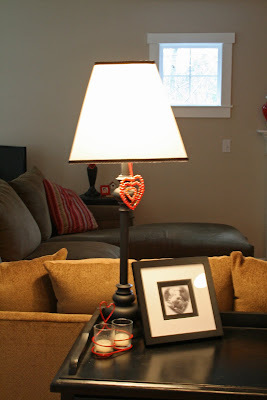 The little acrylic block with a heart is a Goodwill find from this year. My little guy fell in love with it, so I gave in and added it to our decor. 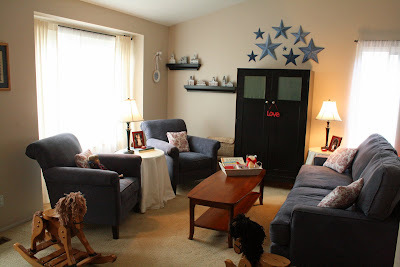 Here's a look into the family room. I've told you about the garland already. The dresser has apothecary jars with Valentine candies as well as a Valentine candle. 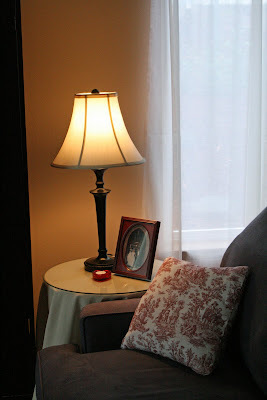 This is a closer look at the little table on the far side of the family room. 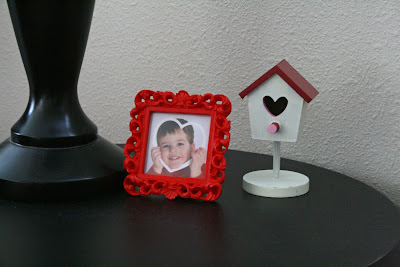 That's my sweet boy last year at Valentine's Day--the frame was $1 at Michael's a few months ago and the cute little birdhouse is from Target this year. That's about it! We're loving the heart explosion around here! Last April I blogged about not really liking my lampshades (too big and too boxy) but not having much money in the budget to change them out. 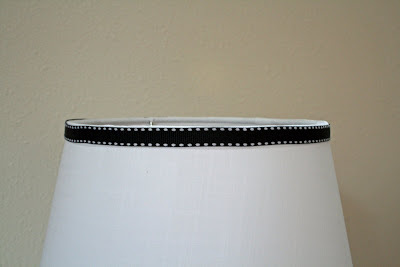 I made them palatable by adding some grosgrain ribbon...but still didn't really like them. The picture above doesn't quite demonstrate the boxy square shape of the shade, but you can get a sense of it. Well, I still don't have much money in the budget to change them out to anything too nice...but when I found this deal at Ross, I figured I could find some spare change to cover the cost. 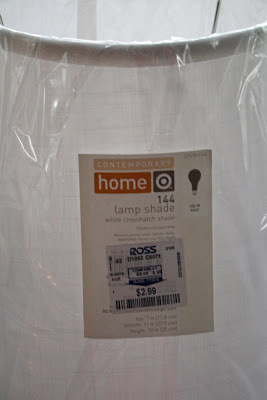 $2.99 each--I saw the same lampshades (with a different label) at Target this week for over $12 each. Woohoo! 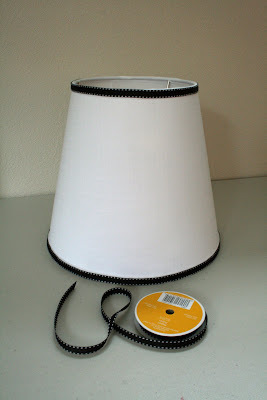 Just like before, I used grosgrain ribbon and my hot glue gun to spiff the lampshades up a bit. 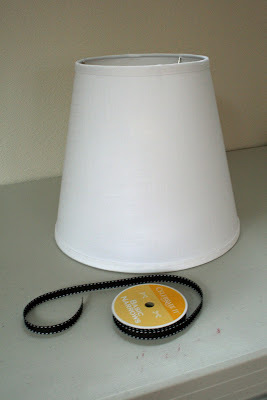 It took about five minutes per lampshade and that was it! I like things to be simple, but the plain white shades were a bit too simple for me. Simple, but I like the clean lines. I added this post to DIY Day at A Soft Place to Land. I'm a SAHM to a seven year old girl and a five year old boy. I spend my time balancing my daughter's need for fluff and frills and my son's need for dump trucks. Sometimes I mix things up and give him the fluff and frills. He's still little...he doesn't mind a hairbow or two now and then.